This Pineapple Chicken I’ve made 2 ways. The first is a stovetop version and the second is a Crockpot version. The main difference is for the Crockpot version, I coated the chicken in cornstarch and browned the meat in a skillet prior to adding to the Crockpot. The family loved both, but they preferred the coated version. You can easily use the coated version of the stovetop too. Directions for the stovetop version and the Crockpot version below. In a bowl, mix the Heinz 57 through brown sugar, set aside. Heat olive oil in a skillet, add garlic, then add the chicken and cook until done; then add the sauce and simmer for 5 minutes. Individuals can add their own crushed red pepper. Put cornstarch in a shallow bowl. In another bowl, beat eggs. 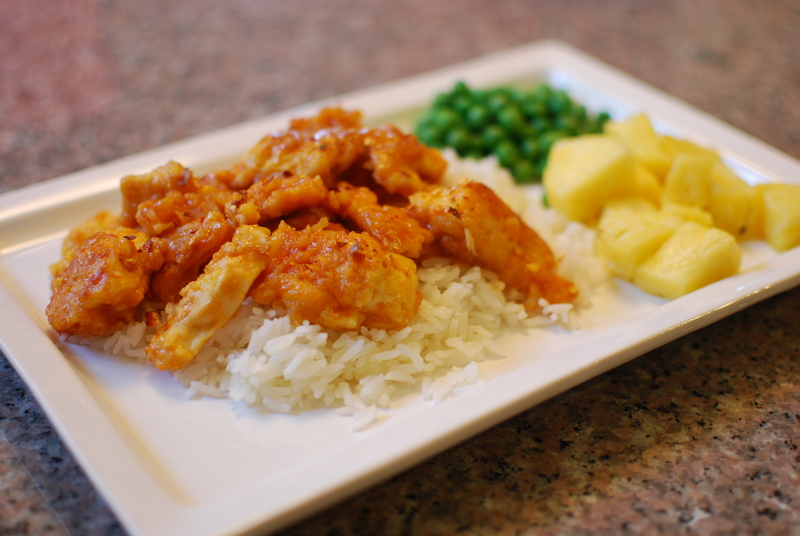 Slice chicken, then dredge chicken in cornstarch and then toss chicken in egg. Heat olive oil in a skillet, add the garlic, and then add chicken and brown (chicken won’t be fully cooked). Place chicken in Crockpot and add sauce.